I decided to make a blade with a wharncliffe shape to it. This is the result. Started off as a piece of leaf spring (5160) approximately 6″ long, 1″ wide and 3/8″ thick. Forged to rough shape then ground (as per usual). As you can see, it ended up about 9″ long total, with a 5″ blade. Handle is black walnut that’s been buffed/polished with 1/8″ diameter brass pin stock. Plus a 1/4″ brass tube to allow the addition of a lanyard. Handle is a little on the short side, but it’s not too short (just doesn’t stick out past my hand). 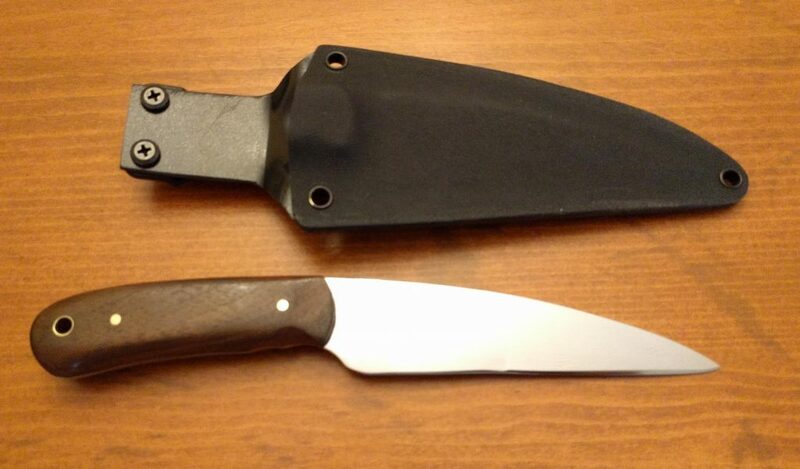 Any future forgings of this blade will include a slightly longer handle (another 1/2″-3/4″ over what this one has). Unless the person wanting it has larger hands. It’s actually comfortable in the hand. The groove placed on the left side of the handle helps with indexing. I do that on the handles so far since I feel it does make it more comfortable.